Newly reformatted, multi-language editions of the beloved classic, published in celebration of the author's 100th birthday, feature new translations and restored and remastered artwork. In 2000 Harcourt proudly reissued Antoine de Saint-ExupÃ©ry's masterpiece, The Little Prince, in a sparkling new format. Newly translated by Pulitzer Prize-winning poet Richard Howard, this timeless classic was embraced by critics and readers across the country for its purity and beauty of expression. And Saint-ExupÃ©ry's beloved artwork was restored and remastered to present his work in its original and vibrant colors. Now Harcourt is issuing uniform full-color foreign language editions. The restored artwork glows like never before. These affordable and beautiful editions are sure to delight an entire new generation of readers, students, children, and adults for whom Saint-ExupÃ©ry's story will open the door to a new understanding of life. About: Imaginez-vous perdu dans le d? About: Imaginez-vous perdu dans le dÃ©sert, loin de tout lieu habitÃ©, et face Ã un petit garÃ§on tout blond, surgi de nulle part. About: (7 x 5 x 0. About: A small boy learns of the wonders and ironies of life during a celestial odyssey. About: ( Ce roman ne contient aucune illustration ) Le langage, simple et dÃ©pouillÃ©, parce qu'il est destinÃ© Ã Ãªtre compris par des enfants, est en rÃ©alitÃ© pour le narrateur le vÃ©hicule privilÃ©giÃ© d'une conception symbolique de la vie. About: An aviator whose plane is forced down in the Sahara Desert encounters a little prince from a small planet who relates his adventures in seeking the secret of what is important in life. 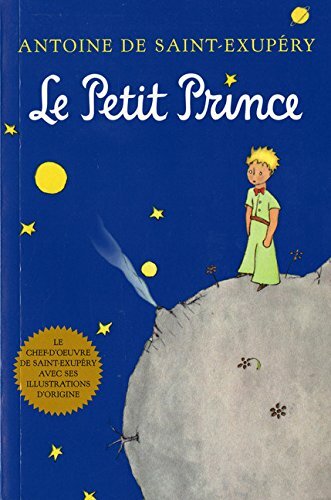 About: le Petit Prince est une Åuvre de langue franÃ§aise, la plus connue d'Antoine de Saint-ExupÃ©ry. About: ANTOINE DE SAINT-EXUPÃRY (1900-1944).